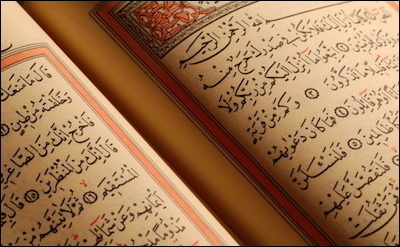 Quranists believe the Quran to be the only authentic source of Islamic teachings. Huffington Post recently published an article titled "The Source of Muslim Extremism," authored by Mike Ghouse (described as "a speaker, thinker, and a writer" who "offers pluralistic solutions on issues of the day"). He argues that all violence and intolerance committed "in the name of Islam is coming from a single source; the secondary books. The Quran is the only authentic book and we cannot go wrong with it. Until we reject those other books, we don't have a prayer." Among these "secondary books" Ghouse identifies the Hadith, which contains the words and deeds of Islam's prophet Muhammad: "As a first step towards fixing our problems, we need to rehabilitate the Hadith." By this he means that any hadith not "compatible with the statements that God is just and the Prophet is a mercy to the mankind" are to be expunged. "Let's stick to the Quran, we simply cannot go wrong," concludes Ghouse. What to make of this argument? the Qur'an to be the only authentic source of Islamic faith. Quranists generally reject, therefore, the religious authority and authenticity of hadith, Sunnah, and reject traditional Sharia Law, with the assertion that they are false attributes to the Islamic Prophet Muhammed. This is in contrast to the Sunni, Shia and Ibadi doctrines, which consider hadith necessary for Islamic faith. Many forms of appalling behavior—from drinking camel urine to "adult breastfeeding"—are justified by finding some reference in the Hadith. Although the Quran suggests that only Allah may torture with fire, a Sahih Bukhari hadith documents Muhammad using fire as a form of torture. Accordingly, the Islamic State referenced this hadith in their fatwa to justify burning a Jordanian pilot alive. Mainstream Muslim scholars regularly denounce Quranists as apostates from Islam. While Quranism resonates with the Western mentality—it's simply the Islamic version of Protestantism's sola scriptura—it is heresy in the Muslim world. Mainstream Muslim scholars, including so-called "moderates," regularly and often denounce Quranists as apostates from Islam. They point out that Quran 33:2 commands Muslims to follow Muhammad's example; and his example—his sunna, which 90 percent of the world's Muslims, the Sunnis, are named after—is derived from the Hadith. Of course, this is precisely why many lackadaisical Muslims (quietly) favor the elimination of the Hadith. As one more fervent cleric complained, based on the Quran alone, "much of Islam will remain mere abstract concepts without Hadith. We would never know how to pray, fast, pay zakah, or make pilgrimage without the illustration found in Hadith..."
Surely that is welcome news to lukewarm Muslims? Unsurprisingly, then, Quranists are regularly persecuted and sometimes killed for their position: Rashad Khalifa, an eccentric Quranist, was found stabbed to death in Tucson in 1990; India's Chekannur Maulavi disappeared in 1993 under "mysterious circumstances" and is believed to be dead; Egypt's Ahmed Subhy Mansour was denounced by and fired from Al Azhar University, imprisoned, and finally exiled. Still, of all strategies dedicated to creating a "moderate Islam"—most of which have no theological basis and are simply built on Western projections of itself onto Islam—Quranism is commendable in that it is at least methodologically viable. The Quran is saturated with violent teachings, needing little supplementation from secondary literature. Unfortunately, its thesis is built on a faulty premise: Even if every single Muslim was to reject the Hadith and other "secondary books," that wouldn't change the fact that the Quran is saturated with violent and intolerant teachings that need little supplementation from secondary literature. Well over a hundred verses call for nonstop war, or jihad, on non-Muslims. If the "infidels" are beaten and refuse to convert to Islam, they must live as third class subjects and pay tribute "while feelingly humbled" (e.g., 9:29). The Quran also prescribes draconian measures—crucifixions, whippings, amputations, stonings, and beheadings—as punishments; and it requires the absolute subjugation of women (e.g., 4:34), with particularly devastating results for non-Muslim women. In short, the first premise of Quranism—that "The Quran is the only authentic book and we cannot go wrong with it," to quote Ghouse—may ease the daily life of the Muslim, but it brings no solace to the "infidel."